Username and password (if you want to connect the server using the SSH username and password). 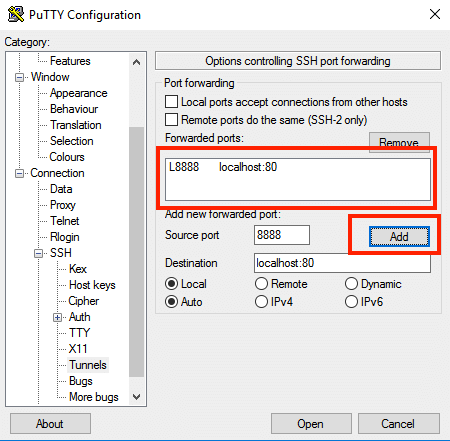 Server username and corresponding SSH private key in .pem format for Linux and Mac OS X (if you have deployed your server using an SSH key pair). Learn how to obtain your SSH credentials for your client. Run the following command. Remember to replace SOURCE-PORT with the source port, DESTINATION-PORT with the destination port, USERNAME (bitnami by default or the username you have entered during the creation of the server) and SERVER-IP with the public IP address or hostname of your server. Enter your SSH password when prompted. NOTE: If successful, the above commands will create an SSH tunnel but will not display any output on the server console.